St. Elizabeth Feast Day continues to be celebrated on the date of her death (17th of November) with several celebrations and pilgrimages in both Germany and Italy where she continues to be venerated as one of the Franciscan family of saints. 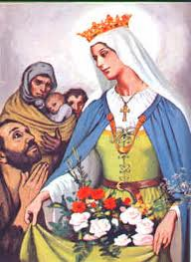 The most famous legend of the blessed St Elizabeth is that one-day she snuck out of the castle whilst her husband was engaged in matters of state in order to take bread to the poor who have gathered below the walls. Her husband came upon her just as she was leaving the castle and ordered her to show him what was in her bag believing that the poor were taking advantage of her. She replied that there were only roses in the bag and when her husband insisted on opening the bag to see for him self that what was there. This story is depicted all over Germany and in many of the pictorial images of the blessed Saint. One notable example is in Budapest's Rozsak tere (Roses’ Square) where there is a statue of Saint Elizabeth and a church dedicated to her. Some relics of Saint Elizabeth remain in Marburg but the majority were scattered by subsequent conflicts. Her skull and some of her bones rest at the Convent of Saint Elizabeth in Vienna whilst the agate chalice in which her skull originally rested resides in the Swedish National Museum. 2007 was marked by a celebration of Saint Elizabeth of Hungary in the town of Marburg due to it being the Centenary of her birth. Highlights were a pilgrimage to the place of her canonization, Exhibitions of paintings and artwork featuring Saint Elizabeth and a congregation of religious figures and students from around the world.